DETROIT (October 29, 2018)—Miller Canfield Associate Thomas C.M. 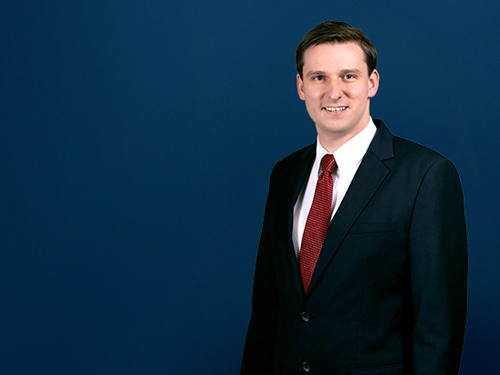 Turner has been named on Michigan Lawyers Weekly's list of Up & Coming Lawyers. The annual Up & Coming Lawyers event and special edition of the newspaper celebrate the accomplishments and potential of attorneys who have been licensed fewer than 10 years. Turner is a banking and finance lawyer, focusing on transactional lending and review, and has developed niche skills in counseling foreign and domestic banks. "In addition to his legal skills, Tom has a particular gift for taking charge and coordinating deals, ensuring that all deadlines are met, and all parties involved are hitting marks," said Miller Canfield CEO Michael McGee. Turner's work has included the representation of an Oakland County tech firm acquiring critical equity and debt financing for working capital and growth needs, representation of a large national bank in providing domestic and foreign credit facilities to a high-tech manufacturer supported by the U.S. Ex-Im Bank, and the representation of a large national bank participating in asset-based secured facilities totaling $2.1 billion. Turner has also become known as an attorney who is passionate about his community and helping people, and during the summer took a pro bono case for the Rocky Mountain Immigrant Advocacy Network, which was helping asylum seekers in highly publicized family separations at the U.S.-Mexico border. Turner's client was a mother who had been detained while crossing the border in Arizona. She and her 13-year-old son were taken into custody and separated. Turner represented the woman at a bond determination hearing, and achieved the best possible outcome. The court ordered the minimum bond. Ultimately the woman connected with relatives in the U.S. and was reunited with her son. They are awaiting a refugee status hearing. Turner also worked on for the Michigan Farmers Market Association, which wanted to establish a program to make loans to organic farmers to build hoop houses (greenhouses with no heaters) to expand their growing season. Turner created an innovative financing structure that aimed at increasing access to high-quality fresh food for low-income people, all while benefitting the farmers and the association. A key part of the financing allows farmers to take their product to market and accept food stamps for payment. The farmers then send the food stamps to the association, which redeems them and applies the money collected toward repayment of the loans. This innovative program has a triple positive impact, helping the farmers, the markets and low-income families, with one pool of money. Turner is active in the community as a board member of the Michigan Sierra Club and the Fort Street Church in Detroit and was in the Fellowship Class of 2016 of the New Leaders Council of Detroit. He is a graduate of the University of Michigan Law School.